... and just in time for the elections, of course. I'll probably have a few posts about political thoughts, but this seems as good a place to start as any (other than the "Campaignin'" spoof a few days back. One of my wife's artist friend's has a blog that showed the "tool" below. I always cringe to some degree at these things, because I generally believe in the circular effect of money. Trace the funding source of polls, research, etc., and you'll ultimately find a "result" that agrees with the bias of the party supplying the cash. I'm just that way. And in the event there is no cash involved, truly objective measures remain very difficult to find. Many of the statements that are rated are worded strongly enough that even conservatives will run from being framed within the Stalin-esque trappings of the wording. No questions are worded where one must run from being a tree-hugger, however. It's not as far gone as "Please answer 'yes' or 'no.' Have you stopped beating your wife?" But the choice in topics and the wording I think tend to compile results forced more to the Left than the Right. In short, I don't mind being a centrist; it sounds sort of "above all that Republican and Democratic nonsense." But I know I'm far more conservative than Democrats in most things. I'm not sure what believing in "economic fairness" means. I believe that there will always be rich, and there will always be poor. But I do believe in right and wrong, and there are plenty of governmental wrongs in our system of economic fairness and seemingly everything else they touch. People are flawed. Government is made of people. So are corporations, churches, professional associations, knitting circles, and (insert group of choice). As long as there are flawed people, there will always be flawed assemblies of people. That for later, maybe. 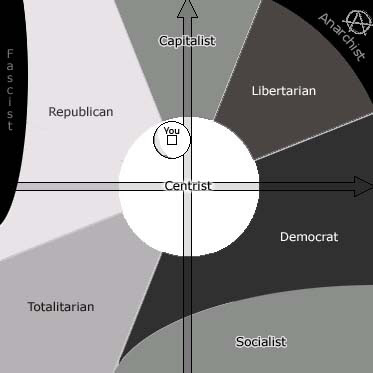 You are best described as a: Centrist: You exhibit a very well-developed sense of Right and Wrong and believe in economic fairness. 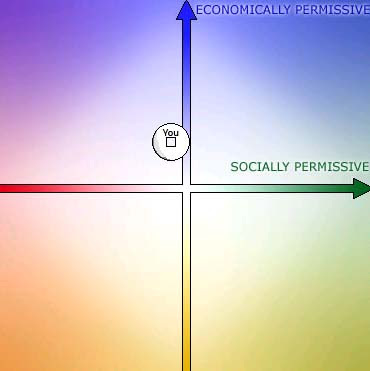 Lol Funny, we share the Social, but are on opposite ends of the Economic and yet we are both Centrists.